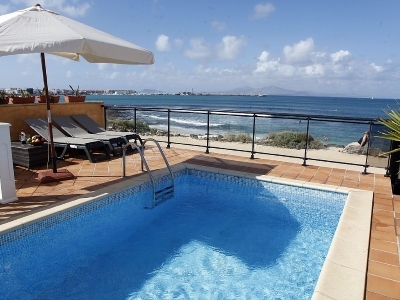 Villa Denise is a three bedroom villa right on Galera Beach in the resort of Corralejo in Fuerteventura. It can sleep up to 6 people. The villa is equipped with all the modern conveniences, including air conditioning and wireless internet access. In the lounge there is a comfortable sofa and armchairs. For entertainment there is a large flat screen TV with satellite channels as well as a DVD/CD player. The master bedroom and the 2nd bedroom both have king-size double beds and the third bedroom has two single beds. There are also two bathrooms, both with a bath and separate shower cubicle. Outside, there is a private heated pool. The sea view is amazing even while swimming in the pool. The surrounding sun terrace has plenty of sun loungers and a sun parasol. There is a gate which leads directly onto the beach. There is also a lower terrace area with a large table and six chairs for alfresco dining, as well as a sofa and armchair for relaxing.